“Ophelia is breaking new ground for a major hurricane. Typically those waters [are] much too cool for anything this strong. I really can’t believe I’m seeing a major just south of the Azores.” — National Hurricane Center scientist Eric Blake on Twitter. Warmer than normal ocean temperatures due to human-forced climate change are now enabling major hurricanes to threaten Northern Europe. A region that was traditionally considered primarily out of the range of past powerful Atlantic Ocean hurricanes under 20th Century climatology. One that, in a warmer world, is increasingly under the gun. On October 14, Ophelia hit major hurricane status as it moved swiftly toward Europe. Packing 115 mph maximum sustained winds over a region of ocean where we’ve never recorded this kind of powerful storm before, Ophelia set its sights on Ireland. Crossing over warmer than normal North Atlantic Ocean waters, the storm maintained hurricane status up to 12 hours before barreling into Ireland. At that time, cooler waters caused the storm to transition to extra-tropical. But this transition was not enough to prevent Ireland from being struck by hurricane-force gusts up to 119 mph, storm surge flooding, and seeing structural damage reminiscent to a category one storm. 360,000 power outages and two deaths were attributed to a storm that should have not maintained such high intensity so far north and east. Yet another historic storm that forced the National Hurricane Center to shift its tracking map east of the 0 degree longitude line (Greenwich) since they had not planned for a hurricane or its tropical remnants to move so far out of the typical zone for North Atlantic hurricanes (see image at bottom of page). In a paper published in April 2013, the Royal Netherlands Meteorological Institute predicted that by the year 2100, global warming would greatly increase the threat of hurricane-force winds to western Europe from former tropical cyclones and hybrid storms, the latter similar to Hurricane Sandy in 2012. One model predicted an increase from 2 to 13 in the number of cyclones with hurricane-force winds in the waters offshore western Europe. The study suggested that conditions favorable for tropical cyclones would expand 1,100 km (700 mi) to the east. A separate study based out of University of Castile-La Mancha predicted that hurricanes would develop in the Mediterranean Sea in Septembers by the year 2100, which would threaten countries in southern Europe. The present Atlantic hurricane season can now only be described as a surreal caricature of what we feared climate change could produce. Texas, Florida, Puerto Rico and a dozen or more Caribbean islands are now devastated disaster areas. Some locations may feel the effects of the off-the-charts powerful storms enabled by a warmer than normal ocean for decades to come. Puerto Rico, unless it receives far more significant aid from the mainland than the Trump Administration appears to be willing to provide, may never fully recover. And now Ophelia has maintained hurricane status until just twelve hours before striking Europe’s Ireland as a powerful extra-tropical storm. 2017 has also been an extraordinary year basin-wide by measure of storm energy. Total accumulated cyclone energy (ACE) for the North Atlantic as of October 15 was 222.5. So far, according to this measure, 2017 is the 7th strongest hurricane season ever recorded since records began in 1851. The most intense season, 1933, may see its own record of 259 ACE exceeded over the coming days and weeks. For storms still appear to be forming over record warm waters. According to the National Hurricane Center, a disturbance off the East Coast of the United States now has a 40 percent chance of developing into the season’s 16th named storm over the next 48 hours. Meanwhile, during recent years, powerful late October storms like Matthew and Sandy have tended to crop up over warmer than normal ocean waters even as late season storms ranging into November and December appear to be more common. In other words, we’re not out of the woods yet and 2017 may be a year to exceed all other years for total measured storm intensity as well as overall damage. Ophelia is a great example of stratospheric cooling allowing a storm to intensify over SSTs that in the past would have been too cool to support it. SSTs were warm enough to support a major hurricane in this region alone even without countervailing cooler stratospheres. This warming ocean surface is the primary scientifically identified driver. If you have another scientific paper on the issue of T delta changes in the stratopshere vs troposphere as an enabler, please post it. But primary driver appears to be warmer SSTs. That said, atmospheric absorption band changes due to rising CO2 and other ghg do produce both warming in the troposphere and cooling in the stratosphere. So this is an interesting climate change related topic of discussion. The increase in intensity is, to a first approximation, proportional to the square root of the difference between SST and outflow temps. Stratospheric cooling is particularly strong over the North Atlantic. Besides the greenhouse gas effects, ozone depletion also increases stratospheric cooling. According to Emmanuel SSTs contribute about half of the observed increase in intensity, and stratospheric cooling the other half. Sulfur aerosols from volcanoes warm the stratosphere – using this method of radiation management, despite its other side effects, would tend to decrease hurricane intensity. Since 2013 the “volcano” that is China has leveled off in its emissions of aerosols, closing its dirtiest mines first. In the last two years we’ve also seen a record CO2 spike. Boom, pause over, stratosphere cools, record hurricane season. Thus the madness of Ophelia is explained. 2. Ground-level SO2 emissions from coal burning stay mostly in the troposphere. Emmanuel, in his presentation on the day of Maria’s impact on Puerto Rico, thinks emissions from Europe might be a cause of the 1960s-1990s hurricane drought, as European emissions go over the Sahara and get pulled across the Atlantic. Since it’s much easier to warm the stratosphere than cool the oceans, we might be able to weaken hurricanes using a short term regional stratospheric SO2 injection. 3. In estimating the square root intensity change, I neglected the outflow temp in the denominator, which changes the estimates. I played around with the equations a bit – with +2C ∆SST and -4C ∆SC I get a first-order estimate of 8% increase in intensity. Since this is happening I guess it’s possible for a hurricane that often hits Baja California could go farther north and hit Los Angeles or San Diego pretty hard as the ocean keep heating up. Seems very analogous. Here’s a hurricane map of one last year that hit Baja and came close to Los Angeles. When you consider that Ireland is well over the 50 degrees north, then you would be looking at it hitting Vancouver island if it were in the Pacific! Well, the cool water current on the Pacific side moves further south than in the Atlantic. Worth noting that increases in Greenland melt rates would also change the dynamic. But we’re not to the point of very large ocean impacts due to melt just yet. We in San Francisco a month ago got hit by an extremely rare Lightning storm. I believe it was the remnants of a hurricane or depression down south similar to what I mentioned. That was highly unusual. It was also very warm and highly unusual summer rain. So perhaps that was a taste of things to come. The Brown clouds on the east side of the storms photos are from wildfires in Iberia and dust from the Sahara desert. The winds from the hurricane caused massive amounts of damage here over the last few days by driving wildfires. Large amounts of wildfires in the north of Spain today, possibly over 50 in total, leading to 4 people dead so far. 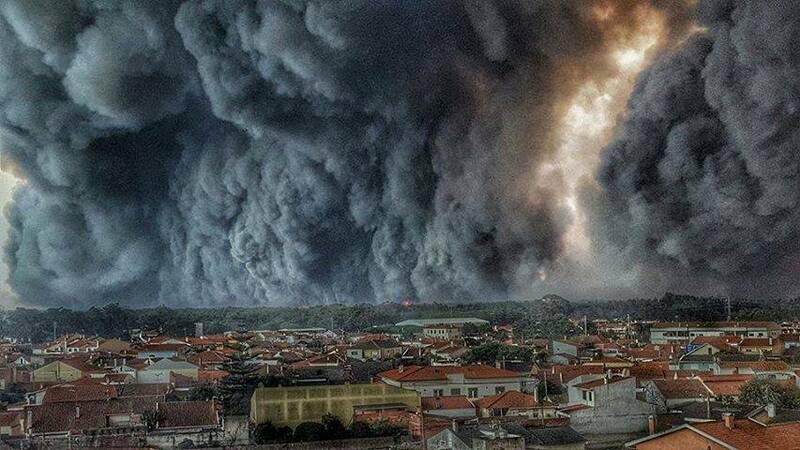 In Portugal there are about 150 wildfires at the moment, mostly burning out of control. Rain is on the cards for tomorrow and a temp drop of up to 10/C in the north and west, so that with the help of much lessened winds this will probably at least kill off a lot of the fires. Portugal has been declared a catastrophic zone in large areas, massive amounts of properties destroyed 32 people confirmed dead so far but a lot more missing. 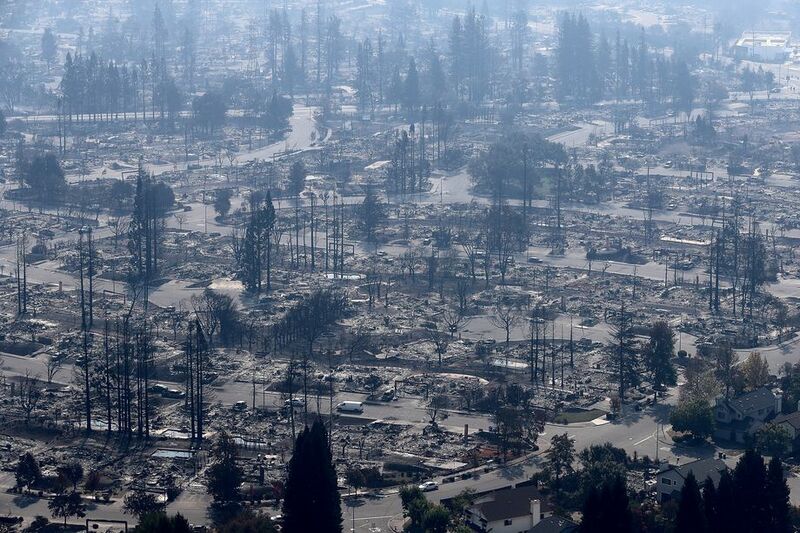 The scenes are very similar to the California fires but with stone and concrete buildings damage does not look as bad until its seen from above. Insanely warm and windy temperatures over the region. The fact that wildfires can be driven by Atlantic hurricanes in N. Europe is yet one more of those weird climate interactions that was unexpected. We got some pretty high temperatures east of Ophelia’s track, as well as the funny light and dust. Having experienced the 1987 storm and willing the crashing trees behind our then house not to come crashing down I feel for anyone caught in the unstoppable force that you just want to go away. I am over 300 miles from the eye of the storm Ophelia but the wind is still gusting over 50 knots and trees and branches are down around town, many still are in leave. However we all know that warmer seas will lead to stronger storms and more damaging floods and this event could be another (ex)canary in the coalmine. While storms of this kind have impacted Ireland in the past, they were typically very rare. In addition, we’ve never seen a major hurricane form so far to the East. Warming SSTs near Europe help to load the dice for these kinds of events. So Ophelia 2017 is incredibly rare – possibly unique – but with certaintly only from the 1960s onwards. This is one event and does not yet form a pattern – worrying and probably expected – and yes waters in the N Atlantic are warmer than recent history. Anyway wind is now dropping and I need my bed. Updated to include more European tropical cyclone climatology and climate change related information. 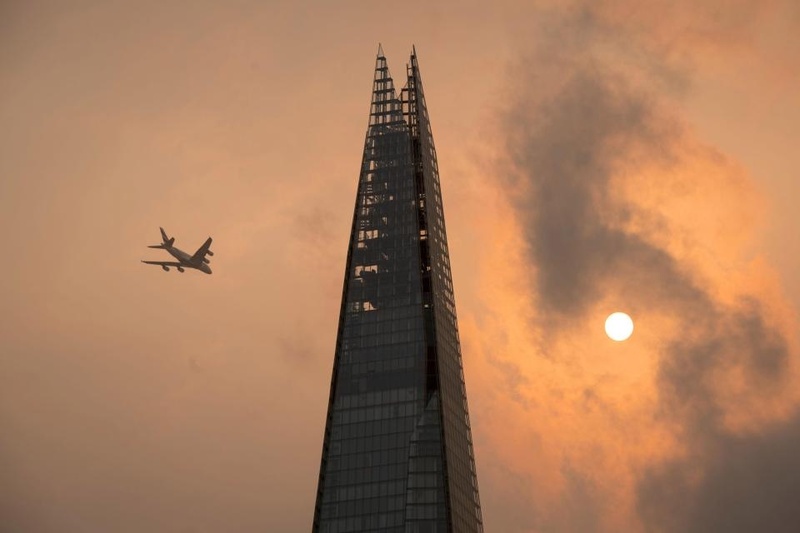 I have just seen an interesting photo of the orange skies over London today caused by the south winds on the hurricanes east side pulling up the smoke and Saharan dust from Spain and Portugal. It will post directly into the comment when the question mark is stripped from the end of the url. To embed an image from the url, the url should end in “dot jpg” or “dot png” or “dot gif”. Strip anthing after jpg, png or gif and it ought to embed ok.
“The more immune you are to people’s suffering, that’s very, very dangerous. There will be too many to manage, soon, if not already. Not good news from Down Under. “The Federal Government will dump subsidies for renewable power and establish a reliable electricity target that favours gas, hydro and coal in a long-awaited energy policy to be unveiled by Prime Minister Malcolm Turnbull today. The two-fold plan, which was expected to pass Cabinet and the Government’s backbench energy committee last night, will mandate that enough renewable energy is produced to meet Australia’s Paris emissions targets but no incentives will be offered. Instead, it is understood the Government will propose changing the rules of the National Electricity Market to establish the twin obligations of reliability and low emissions for the energy sector. The proposed energy package draws clear battlelines with the Labor Party, which yesterday reaffirmed its commitment to the Clean Energy Target recommended by chief scientist Alan Finkel, saying it was the best way to bring down prices. Shadow energy spokesman Mark Butler said that any Government shift away from the CET would demonstrate that Mr Turnbull was hostage to former leader Tony Abbott’s “radical right wing agenda”. Speaking of “Tony Abbott’s “radical right wing agenda””, he’s still making noise and news and nonsense. “…Brandis says “life is too short” to read everything Tony Abbott has to say in a stinging smackdown of his outspoken colleague today. The Attorney-General noted he had heard Mr Abbott had made some “interesting” observations about “people and goats and volcanoes” in his speech on climate change last week but hadn’t bothered to read it. Senator Brandis made the remarks in Senate Question Time today after he was asked about the former prime minister refusal to back a Clean Energy Target. It’s understood pressure from the backbench, including Mr Abbott, has prompted the government to drop the CET from its energy strategy, which is set to be announced this week…..
(Abbot) also hit back at critics of a speech where he claimed climate change was doing “more good than harm”. Mr Abbott suggested his critics hadn’t actually listened to the speech, which sparked condemnation last week from Labor, the Greens and even members of his own party…. “The problem,….over the last few years is that we haven’t been running a system for affordability and reliability, we’ve been running a system to reduce emissions,” he said. Mr Abbott made those key points in his speech to climate sceptics in London but also likened climate scientists to the “thought police” and claimed some of their findings were “absolute crap”. ….Higher concentrations of carbon dioxide were “greening the planet and helping to lift agricultural yields,” he said. To think that as little as six years ago we led the world with a comprehensive suite of well designed, reality based climate policy. That’s all gone now, relentlessly, visciously torn down piece by piece, essentially by one man. There’s a very special place in history reserved for Tony Abbott. On Tony Abbott…no words. Amazing how many “deplorable” leaders in the world during a time when we need “informed, educated” leadership more than ever. Amy Winehouse..a powerful voice…so missed. A data packed presentation here by Atlantic hurricane expert Professor Kerry Emanuel, delivered on the same day that hurricane Maria tore apart Puerto Rico. The final question of the Q&A (@ 1:10:00) broached the subject of hurricane outflow temperatures at the top of the troposphere. Emanuel did not provide an answer. I enjoyed this lecture…Thanks for posting. Gut wrenching, I know the area with many friends there. Maybe change the word leadership to warmongering? Here’s a short amateur clip of storm surge during Typhoon Haiyan. Should be required viewing for anyone living within striking distance. Even the relatively mild Ophelia packed a pretty hefty surge. Not to forget storm surge’s evil twin – swell. At the Atlantic magazine…”Will Northern CA soon have Southern CA climate? Yes, I was thinking the same thing. It also seems like Southern California is starting to get more tropical. Could be wrong, this is just the impression I’ve been getting. When I saw this picture…at first, I thought it was some CGI photo from a dystopian sic-fi movie coming out. Apparently, reality is now stranger, and scarier than fiction. Do you have a link to the news article for this? Just curious. Thanks in advance. In 1980, the engineers of Gulf + Western Industries invented this advanced Zinc Chloride energy storage system to power electric vehicles. Watch this entertaining and informative film describing what still could be the answer to replacing gasoline in cars and light trucks. Outstanding performance at 1/4 the cost of gasoline. Also excellent for load leveling electric utilitities – an important consideration for increasing peak period output, lowering operating cost, saving capital expenditures, and reducing the utility’s envinronmental footprint. One can only wonder too, at Shell’s recent aquisition of Europe’s largest EV charging network. And Richard Branson buying his way into the Hyperloop One company. For all his many faults, Branson has made noise about climate change in the past. You might well say it is just greenwashing, but he has spoken up. I think that battery technology isn’t a money pump like Big Oil, and using some of those vast profits to suppress rival technologies seems logical. I think your article dovetails perfectly to what I read at the Conversation this morning…. Around the globe, about 815 million people – 11 percent of the world’s population – went hungry in 2016, according to the latest data from the United Nations. This was the first increase in more than 15 years. As evidenced by nonstop news coverage of floods, fires, refugees and violence, our planet has become a more unstable and less predictable place over the past few years. As these disasters compete for our attention, they make it harder for people in poor, marginalized and war-torn regions to access adequate food. “Our world has enough food to feed all its inhabitants. When one region is suffering severe hunger, global humanitarian institutions, though often cash-strapped, are theoretically capable of transporting food and averting catastrophe. Permaculture is the best, most efficient way of growing food. But there’s no money to be made as there’s no fancy tech to sell. The old double whammy. Another major storm expected to hit the UK this Saturday. FasterThanExpected …http://www.fasterthanexpected.com/blog/…Third story down …Sinking into the sea: The coastline of the Northwest Territories is eroding faster than scientists can measure it .This was not a personal mission to dip a toe in chilly Arctic waters and come away with photographic proof. On the contrary, the federal government scientist was looking for a time-lapse camera, one of three that met a watery end by the very forces they were meant to capture: rapid erosion on what may be the world’s fastest-disappearing island. Not sure if this was posted or not but ..http://climatestate.com/2013/12/31/planet-likely-to-warm-by-4c-by-2100-scientists-warn/,,,,New climate model taking greater account of cloud changes indicates heating will be at higher end of expectations…The scientist leading the research said that unless emissions of greenhouse gases were cut, the planet would heat up by a minimum of 4C by 2100, twice the level the world’s governments deem dangerous.. Faster than expected perhaps ? “The father of micro finance has a plan to fix capitalism” an interview with Muhammad Yunus 2006 Nobel Peace Prize laureate; creator of the microcredit economic movement; and author of the new book “A World of Three Zeros: The New Economics of Zero Poverty, Zero Unemployment and Zero Net Carbon Emissions. With all due respect, Suzanne, that’s (…). Those types of initiatives have been tried before, they end up further increasing the already extreme wealth of the lenders and further impoverishing the poor debtors, as you might expect. “Around the world, social and political instability are on the rise. Since 2010, state-based conflict has increased by 60 percent and armed conflict within countries has increased by 125 percent. More than half of the food-insecure people identified in the U.N. report (489 million out of 815 million) live in countries with ongoing violence. More than three-quarters of the world’s chronically malnourished children (122 million of 155 million) live in conflict-affected regions. At the same time, these regions are experiencing increasingly powerful storms, more frequent and persistent drought and more variable rainfall associated with global climate change. These trends are not unrelated. Conflict-torn communities are more vulnerable to climate-related disasters, and crop or livestock failure due to climate can contribute to social unrest. Cli-Fi refers to “climate fiction;” it is a term coined by journalist Dan Bloom. These are fictional books that somehow or someway bring real climate change science to the reader. What is really interesting is that Cli-Fi books often present real science in a credible way. They become fun teaching tools. There are some really well known authors such as Paolo Bacigalupi and Margaret Atwood among others. A list of other candidate Cli-Fi novels was provided by Sarah Holding in the Guardian. Persistent heavy rain falling today in Spain with some areas getting their first rains for anything from 2 months to 5 months. The 150 plus wildfires are not under control but the next problem is the run off from the burnt land getting into the rivers and the estuaries, this is projected to lead to contamination of the sea shellfish life and lead to problems with coastal fishing industries. Meanwhile anything up to 4 inches of rain fell today, in some cases 3 inches in less than an hour, this has lead to localized flooding and a lot of damage in some areas. Jerez had cars swept away and basements turned into what was called underground swimming pools. Large areas of agricultural land are suffering from flash flooding. As of tomorrow the 19th October, the rains will depart and the weather is set to be dry and very warm again for many days to come. There is a strong possibility that wildfires will return again soon. Over 40 people dead in Spain and Portugal as a result of the wildfires which are now contained but in some cases almost everything in entire villages has been wiped out. How good where the climate models ? https://www.instagram.com/p/BZ38rf7F3al/?taken-by=carbonbrief ,,, look good to me for the most part . 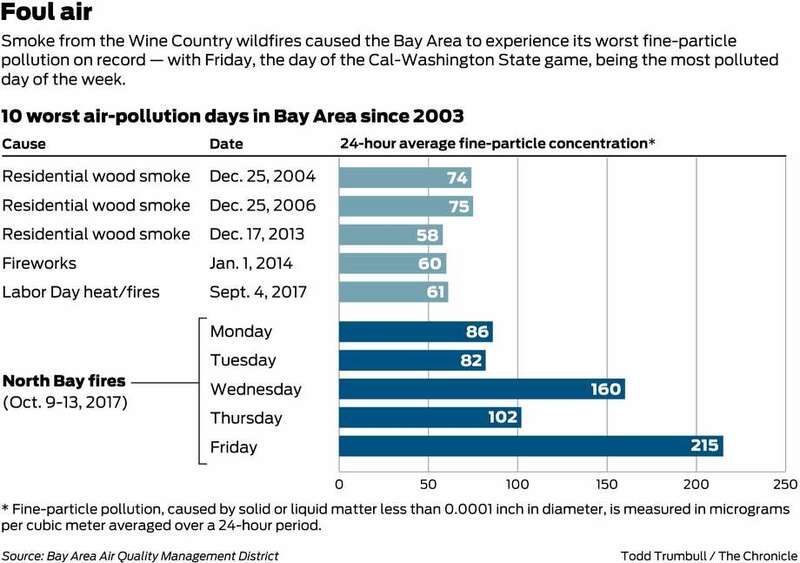 The rain thats forecast tomorrow for Napa should realy make a difference in putting those out but the fires wont go much south of napa so the rest of california south is dry and this can be terrible news. My friend CB linked to this article over on WU. Comments & selected quotes are my own choosing. For a couple of years now, I have been asking people if they have noticed less bug guts on their windshield. Growing up in the midwest, I distinctly remember a huge mess, especially after night driving. I thought maybe it was less because I moved to different areas, but it appears not. No way to really spin this one into a happy story (though the Post author does his best at the end of the article). Welcome to the collapse of the biosphere. The explanation/cause determined from the data is “unknown”. CB is still in the game. Why hasn’t he returned here? CB your insights are sorely missed. Time to return. I add my voice to that plea. Colorado Bob, where are you? Agree – come back CB, miss your contributions, wit and most of all your music offerings. If that is confirmed it is a massive story. I can’t quite believe that a drop like that hasn’t been spotted before. Everyone of a certain age is aware the the windscreen splatter is very different now, but how could the specialists not be switched on to it? Regular people were noticing it too. I had conversations with several people on Twitter, most of them on the eastern USA, who had noticed an absence or severe diminution of butterflies in their gardens. Monarch butterflies were the most missed, but some people said even cabbage white butterflies were missing. Ive talked to people around here for over 10 years about bug depletion . as a kid the 3 hour drive to Victoria used to cover the front of our car with bugs, we HAD to at least clean the headlights , now when I go visit my son , no problem , drive back no problem , er umm , yes this is a problem ! the river of rain is falling hard on B C , washing the burnt out forest into the rivers !! What a brutal year for forests .. Wild mushrooms came out in earnest about a month and a half late , The forest was cracking under each step up to about a week ago , the rains are a month and a half late and drowning out whats left of Cantrells , All species are suffering from this third year of no late Aug. rain . Ive seen 2 Ammenalias all year , Sad. Yahoo has the WP article ..Amazing all the negative hateful comments that it is “Fake news “to say insect splats on windows is absent.What kind of person would write such unbelievable lies ? We have discussed this previously and many of us have noticed how when travelling by car in the summer that windscreens do not now get plastered with squashed bugs, especially the big juicy ones that dried and were impossible to remove. suggested that pesticides are the likely the main cause. Looking at the graph, the large decline starts when mobile phone coverage started, I would also like to see research as to wether micro-wave mobile phone towers are also affecting insect life. Perhaps the combination of pesticides and microwave radiation has been the tipping point for insects and small animals. I now turn the router off when not in use and changed the DEC phone for a eco low emission Siemens phone that only powers up when a call comes in. If micro-wave does damage insects then it will damage us. The piece of forest I keep has as one of its borders an eletric transmission line (a big, interstate one, that transmits energy from Itaipu dam to Rio de Janeiro and Minas Gerais), that should be plentiful of EMF. But I have noticed no diminishing of insects here… au contraire, I´ve already seem 38 different species of butterfly in this beginning of spring in Brasil, and plenty of different bees, mantis, dragonflies, etc. Absent of this place are deforestation (I´ve been adding trees, not taking them out) and use of pesticides. This is just annedotical, of course, but I´d expect that the worst problem is pesticides and destruction of habitat, not EMF. Being of a Broadband /Carrier background in Telecoms, I consider a factor to be taken into consideration is not just the EMF. but most specifically it’s frequency and the harmonics of that frequency, all matter has it’s own resonant frequency and whether the frequencies of the carriers and whether analogue or digital (the modulation techniques are increasingly complex) resonate with biological aspects in the insects. Xi’s remarks came as the country has increasingly focused on shifting from relying on fossil fuels to reduce its deadly air pollution and coal overcapacity problems at home. But China has also realized that these efforts allow it to command greater respect on the world stage, particularly as the US, under president Donald Trump, has made it clear it isn’t interested in playing a leadership role on safeguarding the environment. Global declines in insects have sparked wide interest among scientists, politicians, and the general public. Loss of insect diversity and abundance is expected to provoke cascading effects on food webs and to jeopardize ecosystem services. So this study is from Germany. Can we extrapolate beyond? It is a huge wakeup call. Could there be a link to the decline in bees and one of the new class of insecticides? Do we have anecdotal evidence from other regions of the world that don’t use the same agricultural products? Or don’t have the same temperature/climate changes? I just realize that where I wrote neocotinoids i should have written neonicotinoids. Cuba does not use insecticides and their bees are doing well. Its been well known now for a couple of decades that it’s the application of insecticides which take out bees and many other insects. Just like global warming, the time for questioning the root causes is long over. Yes. It’s a similar deceit. “In my discussions with colleagues this week, not one weather or climate expert could think of an example of a tropical cyclone (Ophelia) in the last 90-plus years that has sparked such a series of megafires (Portugal). The closest corollaries were a 1978 storm in western Australia and a 2011 storm in Texas. Each fanned large fires, but the loss of life was relatively low. In 1923, a typhoon worsened the impact of fires sparked by a massive earthquake in Japan – but again, that required an earthquake. Like Portugal, California has a Mediterranean climate that features a long summer dry season. In the wake of the state’s record-breaking wildfire season, which occurred under similar weather and climate conditions as the Portuguese fires, there’s a lot the West Coast can learn from what’s going wrong in Portugal. The financial cost from pollution-related death, sickness and welfare is equally massive, the report said, costing some $5.9 trillion in annual losses, or about 6.2 per cent of the global economy. “There’s been a lot of study of pollution, but it’s never received the resources or level of attention as, say, AIDS or climate change,” Dean of global health at the Icahn School of Medicine at Mount Sinai, New York, and the lead author on the report, Philip Landrigan said. “Pollution is a massive problem that people aren’t seeing because they’re looking at scattered bits of it,” Mr Landrigan said. During the period of global warming at the close of the last ice age, Earth’s sea level did not rise steadily but rather in sharp, punctuated bursts when the planet’s glaciers melted, researchers report. The researchers found fossil evidence in drowned reefs offshore Texas that showed sea level rose in several bursts ranging in length from a few decades to one century. “What these fossil reefs show is that the last time Earth warmed like it is today, sea level did not rise steadily,” says coauthor André Droxler, a marine geologist from Rice University. “Instead, sea level rose quite fast, paused, and then shot up again in another burst and so on. Nice work. Like they stated this was suspected. This knowledge is important because you need to know what to plan for. I live in the Netherlands and we rebuilt our dikes (levees) after the 1953 floodings. I tried to find the odds they planned for but failed to do so but basically you plan for maximum sea level/flood height (king tides etc) + maximum expected storm. Off course the average sea level rise has increased since then but the real changer is that the kind of storms we can expect might be worse then they expected back in the days. And then you still need an good prediction for sea level rise so this helps. The boring company is working fast. Tunnel beginning between Washington and Baltimore. Privately funded by Musk under state roads so far. A side show in our narrative but relevant. Only electric transport will use these tunnels whether regulated or not as the expensive and time consuming ventilation needed for ICE won’t be used. wtf? How did we go from O to B in a week or so? I think, Wili, it is because Ophelia was a hurricane, but the north Atlantic storms have their own alphabetical naming sequence. Storm Aileen had already occurred in September, so this is the next Atlantic storm of the season for northern Europe. The US National Hurricane Centre numbers tropical depressions in the tropical Atlantic or Caribbean and names them if they become strong enough. Harvey, Irma, Lee, Maria, Nate and Ophelia are part of that sequence. The UK and Irish Met Offices have been seeing more severe storms forming in the North Atlantic and started to name them last year. Aileen and Brian are part of that sequence. Ophelia was already named by the Americans before it approached the UK, so there was no need for a separate UK name. Storm Brian hits the prom in Aberystwyth. Think you would park the car somewhere else! Thanks, Syd and Em; Not sure how I didn’t know this. Yes, this necessary obsession makes us odd. Psychologists say that the ability to ignore worrisome factors in our environment and remain functional is a sign of maturity. But, in this era of global warming, we need political activism to catalyze rapid change. So, being normal, and carrying on in a normal calm sane manner, submissive to authority, could kill us all. Especially since the authorities are in bed with the fossil fuel powers, although that appears to be changing. Let’s hope that we the freaks become trend setters, I think. What we need are disruptive technologies, like electric cars and solar energy. It’s hard to control the spread of technologies that have a cost advantage over the status quo. A truly intelligent species would have mobs in the streets, at this point, demanding BECCS (Bio-Energy with Carbon Capture and Storage), I think. Or not…depending on how low we can drive the cost of BECCS, how well we can make it fit into our world, how ecologically sound we can make the storage of so much carbon, and how big we can make the scale of this solution. Good article; worth the read in its entirety. climate scientists do know why conditions were tailor-made for the swift-moving maelstrom that killed 42 people, burned 6,700 homes and buildings, and blanketed millions of people in toxic smoke: Hotter temperatures; drier, abundant fuel; and stronger winds. What caused all that? The answer is simple, obvious, and predictable: climate change. Forty years ago, the average length of “fire season” in the western United States was about 138 days—the start of summer to the first winter rainfalls sometime in October. Now, says LeRoy Westerling, a professor at UC Merced and co-director of the school’s Center for Climate Communication, fire season in the West—the arid West, a vast inhospitable expanse made habitable for the white man’s notion of civilization thanks only to the power and glory of irrigation—lasts 222 days. This shift happened in our lifetimes. Since 1980, average global temperatures have escalated steadily and rapidly. Sixteen of the 17 warmest years on record have all come since 2001—and the world was noticeably hotter well before then. In that time, the areas burned by wildfires in the west have increased 390 percent—that is, “390 percent per decade, over that original baseline,” Westerling said during Tuesday’s conference call. The probability of grasslands igniting has also increased significantly, from a 0.5 to 0.75 percent chance to a probability of between 1 and 2 percent. Even if we stabilize carbon emissions now, a task that will almost certainly require total regime change in Washington, D.C., “temperatures will keep increasing and the climate will keep changing for a while,” Westerling said. “This is part of what we have to learn to adapt to live with.” ……. Linked in ^that article, another worthwhile piece, this one from a couple of years ago. “…..Today, California and much of the West are enduring the fourth year of a record drought that has triggered unprecedented cutbacks in water use and unabashed fears for the region’s future. The crisis has also triggered much talk about who, or what, is to blame. Environmentalists point fingers at global warming and greedy agribusinesses that insist on growing thirsty crops in an arid climate; right-wingers assail feckless Washington bureaucrats and laws that give fish priority over people. But read the history of how the West—which, after all, is largely desert and semi-desert—obtained the cheap, abundant water that its residents now take for granted and a different picture emerges. As much as any other factor, it is the legacy of the Bureau of Reclamation—this federal agency’s decades of building hundreds of dams and canals to move massive amounts of water vast distances to serve human desires—that has left the West so vulnerable to the current drought. Haven’t read Cadillac Desert, but I think we have to recognize that California really was a kind of paradise, decades ago. Storms that filled the Sierras with snow pack every year, regular as clockwork were part of that paradise lost. We had plant communities that were actually adapted to the climate that we had back then. So the Bureau of Reclamation was just filling a functional role, and making relatively ecologically sound use of a natural resource, I think. Now we have lost that. Santa Rosa and Sonoma aren’t “God’s Courntry” any more. Like a fool, I thought that the Northern California coast would be relatively safe from the ravages of climate change…protected close to the coast by the ocean currents flowing south from the Arctic. Wrong, wrong, wrong. The disruption from climate change will be felt all around the world, and those who think they will be climate change winners are very likely to be wrong, I think. No matter where we live, our biological communities will not be adapted for the new climates we find ourselves in. I was wondering the other day.. how long until we see something similar strike the grain belt with thousands of acres of wheat or corn going up in smoke? Years of high temps and low rains preceded firestorms in California. Similar conditions in the Midwest, albeit minus extended heatwaves. 73 F. high temperature on October 17, 2017 in the Twin Cities, Minnesota. 72 F. high in the Twin Cities on October 17, 2016. “So far, the nation’s largest and most productive agriculture regions—the Midwestern Corn Belt—have largely escaped the most cataclysmic events of what has been a terrible, horrible, no good, very bad year for climate-related mega-disasters. “Shifting climate patterns in North America could hit U.S. crop production hard, possibly even halving the production of corn by the end of the century, a new study finds. Scientists believe that the spike in average temperatures that is widely predicted by climate models for North America could hurt its agriculture sector. As the number of days that are hotter than 30 degrees Celsius (86 degrees Fahrenheit) increases, they now predict, estimated future harvests of wheat, soybeans and corn could drop by 22 to 49 percent, depending on the variety of the crop. These concerns didn’t need to be ranked and certainly not in this order. Otherwise, this piece is good. “Which of these would you name as the world’s most pressing environmental issue? Climate breakdown, air pollution, water loss, plastic waste or urban expansion? My answer is none of the above. Almost incredibly, I believe that climate breakdown takes third place, behind two issues that receive only a fraction of the attention. New Zealand has a new government led by the Labour party with a smaller, populist party called NZ First. They are supported by the Green Party who will get 3 cabinet positions including Minister of Climate Change. All 3 parties support a Climate Change Act (to make NZ carbon neutral by 2050) and an independent climate commission (to set targets and plans). This is a huge change as NZ’s gross emissions are up 24% since 1990 – amongst the highest in the OECD at 18t/cap – and we have been party to a huge international fraud involving trading of dodgy carbon credits. He’s right about dairy. Our largest company, Fonterra, is also our largest user of coal – they burn it to dry milk into milk powder, emitting 2.2Mt of CO2 last year. But I don’t think I’ve heard of anyone, even an American coal baron, calling coal a “transition fuel”! Thanks Robert, I was shocked at how Bathurst’s framing of “transition fuel” was allowed to go unchallenged by our (compliant) media. Hopefully the new government will work towards reducing Fonterra’s monopoly and their impact on Earth, and work towards assisting companies who have worked out how to make a profit AND protect people, land and water. Many of NZ’s ecological* problems have arisen from successive governments favouring quangos and monopolies and turning a blind eye to their single economic focus (hence NZ’s obsession with exporting unprocessed materials for a quick return and also how the milk payout system appears to favour milk over other forms of farming. * We should use words that place people within, as part of, our natural world, so using e.g. Earth, ecology, home or nature – ecology from Greek oikos/ home. ‘Environment’ is a binary word that places us as separate from our life-support, let’s place ourselves within our home when we speak on nature’s behalf. Xinjiang, a land of mountains, forests and deserts, is four times the size of California and is home to 20,000 glaciers — nearly half of all the glaciers in China. Since the 1950s, all of Xinjiang’s glaciers have retreated by between 21 percent to 27 percent. In the past 50 years, says Li, the average global temperature has risen by 1 degree Celsius (1.8 degrees Fahrenheit). As a result, these glaciers — split from the original Tianshan No. 1 glacier into No. 1 East and No. 1 West — are retreating by around 30 feet each year. Two hundred miles away, at the foot of the mountain range, conditions couldn’t be more different. At a grape orchard near the city of Turpan, it is 70 degrees warmer. This city sits on the edge of the Taklamakan Desert and is considered the hottest place in China — and the lowest, at 500 feet below sea level. This area gets, on average, half an inch of rain per year. But it’s an agricultural powerhouse. Nearly all of China’s grapes are grown in this valley. The water this region depends on arrives in the form of snowmelt from faraway glaciers, flowing here through thousands of miles of underground tunnels called karez, an ancient irrigation system built 2,000 years ago. Turpan’s karez wells are considered one of the great engineering feats of ancient China. Down a hole in the parched, yellow earth, cool water from the mountains flows through the karez beneath the vineyard of Magcorjan Abdurehim. The farmer stands in the hot sun, worried. A karez in Turpan is part of a 1,000-mile network of ancient water tunnels. There used to be nearly 2,000 working karez throughout this region, but that number has shrunk to less than a couple hundred. Melting glaciers in the mountains above Turpan have meant more water flowing into the region, but that has also led to a boom in industrial farms and oil companies competing for water in the karez. The ancient irrigation system is quickly running dry. Abdurehim shakes his head at the whole affair. The weather isn’t helping. In July, the temperature here reached a record 119 degrees. Higher temperatures mean fewer grapes, he says. It also means fewer glaciers. New York — Miguel Torres Maczassek is the fifth-generation owner of Bodega Torres in Catalonia’s Vilafranca del Penedès, about an hour outside Barcelona. Yet in 2012, he bought 195ha of land 1,200m high in the Pyrenees, even though it’s not possible to grow wine there … yet. Torres expects climate change to make it viable to produce grapes in a decade or two. “Until now, I have never known a year in which it was too hot to make successful wines in Bordeaux or Burgundy,” wrote Denis Dubourdieu, the late, highly respected winemaker and researcher, in the Journal of Wine Economics last year. He was joined by 18 others in that report, including two members of the Torres family. Their data were uniform: earlier harvests, less acidic grapes, awful rains and droughts and higher humidity — including “almost tropical conditions” in Germany. There’s nothing “humble” about this nonsense. A winery bragging about its apparent foresight and advnatage-taking of dire circumstance isn’t humble and it’s not at all worthwhile vis a vis actually doing something positve to mitigatre or improve our common dire circumstance. While the planet’s roasting there’s nothing about this winery’s self-promotion worth toasting. Good Morning fellow Scribblers. Hope everyone is safe and doing well. Wicked busy organizing our local grassroots GOTV group..
Also, wanted to share some information on a GOTV project has formed which has been active in Massachusetts, but has now expanded to 6 states that I have looked into..and get some feedback from you all. The Environmental Voter Project is a non-partisan group, that goes after “inconsistent” voters that are usually ignored by candidates and political parties. They use meta data to “identify” these inconsistent voters as being individuals who feel the environment is a priority..but for whatever reason don’t vote. The group, EVP (Environmental Voter Project) uses their meta data with a 90% accuracy rate in finding these “inconsistent environmental voter” then work to get them to the polls. After going to one of their webinars and talking to one of their staff…the only concern I have about their efforts is they don’t “educate” the voter…they just focus on getting them to “pledge” to vote. The problem I have with that approach..is, for instance, our Tea Party Republican Congressman is very good at “appearing” to be environmentally friendly as it applies to our local environmental issues. You have to be paying close attention, and be highly informed, to read through and past his B.S. He is a smooth, slick operator. But he is the typical…Republican…he is all about deregulation..was for pulling out of the Paris Climate Agreement…and 100% on board with the deregulation of the EPA. So, my fear, at least for my district..is EVP gets people here to the polls..and these people don’t do their due diligence..and pull the lever for the “slick” Tea Party Republican. What I would really like…is to get ahold of their “inconsistent environmental voter” list…knock on those voters doors in my district…and “educate” them on. Dear Suzanne, Your post is moving and the situation you describe extremely difficult to overcome. Modern politicians do seem to have added a new twist to millennia-old traditions of hypocrisy. Just as bad is the way they have learned to talk and talk, pour on oil, yet say absolutely nothing. However, the EVP does sound like a worthy effort. Voting is a collective issue like climate change and is susceptible to the same threats of free riding and the tragedy of the commons. It has to be defended and supported at all costs. As far as action on climate change goes, I think all the work of this blog and its readers is essential. In the short term we continue to push for more renewable electricity and electric vehicles, for these are the areas where there is generally broad support. At the same time we can try and extend the discussion into new areas of decarbonisation and trying to get people to make connections – I believe that eventually the message that we must stop all burning of fossil fuels, and that driving a fossil-fueled car is wrong, will become widespread. An active storm system forecast for the UK. More storms are on the way for the UK – following the strong wind, rain and flooding brought by Storm Brian. Although mild weather is predicted for next week, forecasters for Accuweather predict another 10 to 13 named storms will hit Britain this autumn and winter. Only five were recorded in the same period last year. “We expect an active storm period until January, with further storms until April,” said AccuWeather’s Tyler Roys. The eight-year study from more than 250 scientists finds that infant sea creatures will be especially harmed. This means the number of baby cod growing to adulthood could fall to a quarter or even a 12th of today’s numbers, the researchers suggest. The assessment comes from the BIOACID project, which is led from Germany. A brochure summarising the main outcomes will be presented to climate negotiators at their annual meeting, which this year is taking place in Bonn in November. He told BBC News: “Acidification affects marine life across all groups, although to different degrees. “Warm-water corals are generally more sensitive than cold-water corals. Clams and snails are more sensitive than crustaceans. “And we found that early life stages are generally more affected than adult organisms. “But even if an organism isn’t directly harmed by acidification it may be affected indirectly through changes in its habitat or changes in the food web. A synthesis of more than 350 publications on the effects of ocean acidification – which will be given to climate delegates at next month’s summit – reveals that almost half of the marine animal species tested reacted negatively to already moderate increases in seawater CO2 concentrations.